We are drenched. We are filthy. We are exhausted. But the grins on all 10 of our faces, at the roadside café, are wider than the vast dirt road we have just left. It’s only day three of our adventure in Cambodia and we are all already completely hooked on this beautiful country. Bright and early in the morning, our bikes (a selection of Kawasaki KLX250s and a few KTM EXC 450s) are ready and primed for action. Our group leave the hotel in convoy, through the busy morning traffic and head for the first of many river crossings on the trip. Our progress is short-lived though, as the first of the trails has been washed away by the river, and we’ve had our first puncture. After the support guys fix the tube, we re-route and follow a fantastic series of tracks that border the river and cut into the agricultural land and forests that follow the water. One minute the the terrain is like an English orchard, the next it’s temperate rain forest, the next open farmland. After an amazing day of epic trails and smiles, we journeyed by ferry to our overnight stop in Kampong Cham. A shower and freshen up is followed by dinner before some of the lads go in search of a massage and karaoke – but less of the karaoke. Whether the boys enjoyed a happy ending or not was never discovered, but by 8am we are back out on the roads. As we leave the town, the road follows the mighty Mekong as we zip through the bustling villages. Stopping for a drink in front of an intricately carved temple, we take in the vista of the river plain and the ancient buildings that surround us. Well, most of us do, but the contemplative silence is broken by one of the boys violently vomiting over the side of the temple walls. Clearly his evening meal was disagreeing with him. 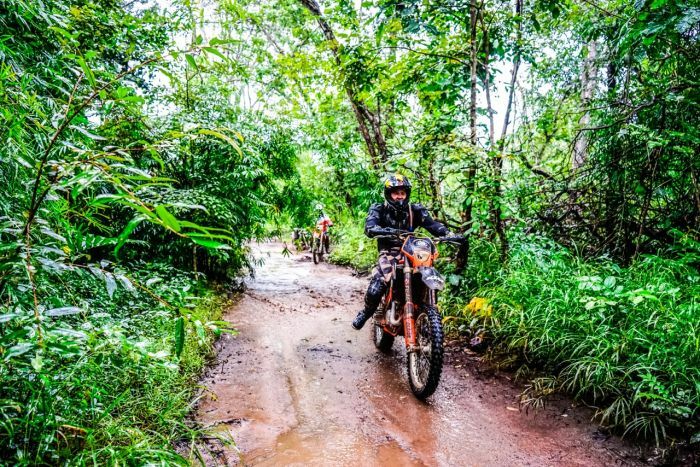 After lunch, we leave the road to take on some fantastic and fast trails through plantations. All around us there are vast swathes of rubber, cashew nut and cassava trees. 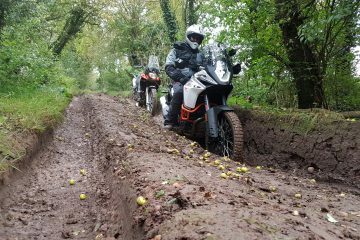 The best section of the day is a long stretch of sandy tracks that follow between two overhanging hedges – it’s like a trail riding video game and we are all pinned and carving the berms like we are off-road legends. Day three on the trails turns out to be one of the high points of the trip. Leaving early, we soon turn onto a narrow trail known as the King’s Highway that disappears into the jungle. 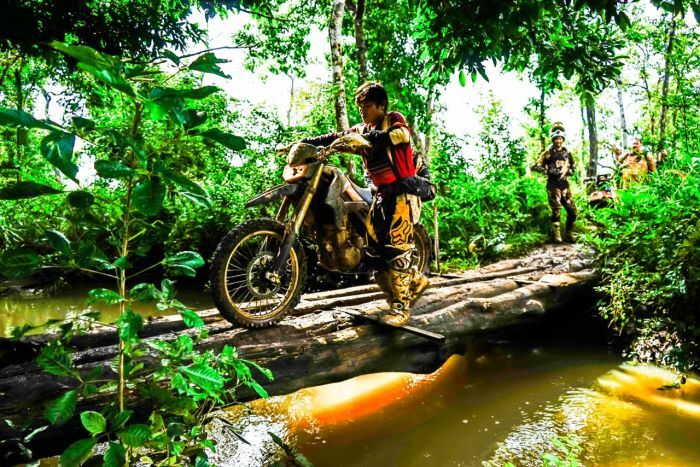 The route has everything – deep gravel, mud, sand, roots, hardback and rock. As we slice through the undergrowth trying to avoid the mud and keep the pace, the trails just get better, and at one point we are travelling through bamboo that is neck height if you stay sat down. I’m on the pegs in the lead group and I can see a comical trail of helmets floating through the undergrowth. The trails open up to 10m wide tracks made from super-grippy red mud and for the next hour and a half we are pinning it through the landscape without giving one solitary feck. From stutter bumps to bridge crossings, it’s flat out and I cannot stop smiling. 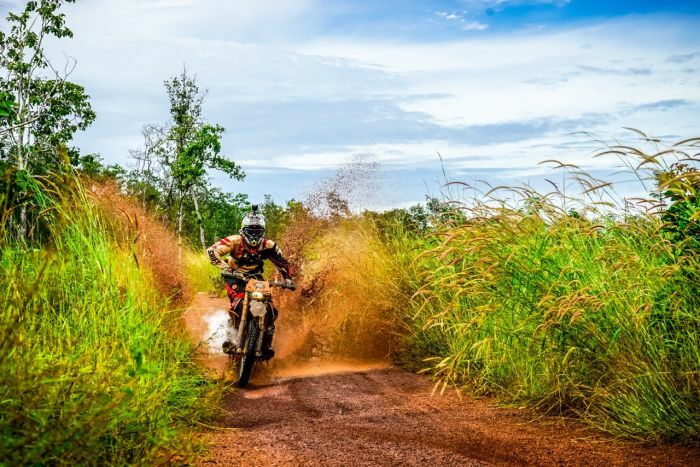 When we eventually reach the road for iced coffee and cokes, the red mud is everywhere and we are drenched in sweat, but it makes not one jot of difference – this is dirt bike heaven, and we are riding it. After such an arduous day, we are pleased to take the road for 25 miles to bring us to our overnight destination. We follow a short-cut in, but the red clay trail is stupid slippery and one of the boys takes a tumble – I should have taken note. The following morning, we are on the bikes early and hit the clay trails. Climbing the first hill my back wheel kicks out, hits the side bank and spectacularly highsides me around six-feet into the air. 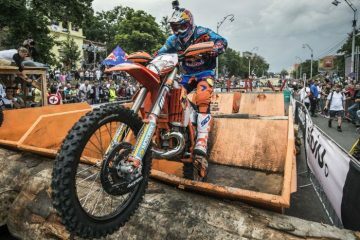 Luckily, I land away from the bike, but in the process, I’ve whacked by legs on the bars and I take a few moments to recover. My body armour and knee pads have done the job and luckily, there are no other injuries. The second part of the trail takes us through more forest and river crossings before we hit a long and stupidly muddy road. The ruts are endless and the grip non-existent. 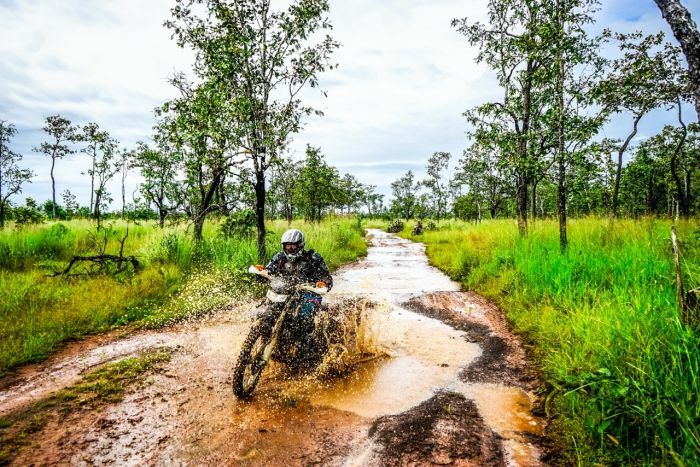 We crab, slip and paddle our bikes as they become increasingly loaded with mud and by the time we eventually see the road, after what seems like hours, we couldn’t be happier. Thankfully, we have some tarmac time before lunch and after, we turn onto fast and sweeping trails through plantations that take us into the bustling town of Banlung. With our kit ditched, it’s straight into the bar for a bit of a blowout, as the next day is a rest day with some awesome sightseeing lined up. After a couple of days of technical trails, the next day’s riding is both fast and furious, as we follow fantastically long and straight dirt roads. 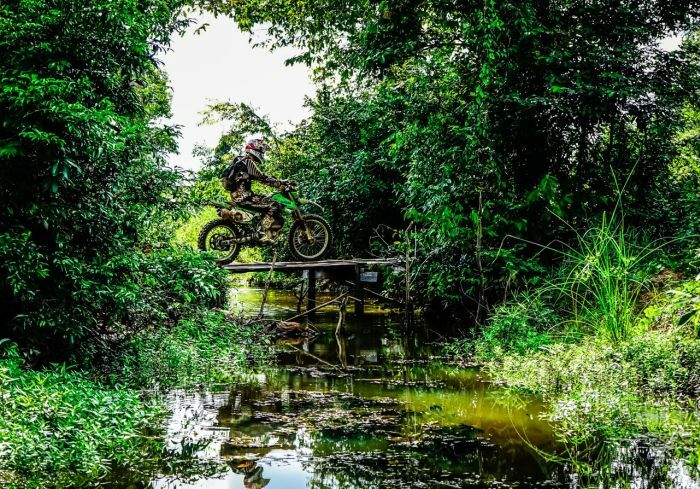 The flat-out speed tempered by the regular wooden bridges that demand respect but occasionally deliver a monster jump and an even bigger grin. The plantation trucks we pass are like something out of Mad Max and we follow the Mekong north, towards the Laos border. In the afternoon, we stop at a small village on the riverside and take a boat trip that allows us to see the ultra-rare Irrawaddy dolphins. There are only five in this stretch of the river and less than 300 in the entire Mekong thanks to their docile nature and inability to avoid propellers. Next, it’s more sweeping dirt roads to start for a good 20 miles, before we turn into hard-core jungle trails that test our skills with tough going and every surface possible. As the trail gets wetter, we are having more difficulties and with a possible mile more of axle deep mud to negotiate, we escape across some rice fields to reach a better trail – we’re all so hot and knackered that after the next river crossing, the boys go back and jump into the river. The morning brings torrential rain and none of us are rushing to get on the bikes. Luckily, it stops just as we are about to leave and we travel a short distance to climb the enormous hill towards the stunning Preah Vihear temple. Climbing the ruins in motocross kit is hard work, but it’s an incredible place with stunning views. The trails that we ride throughout the rest of the day are just joyful – long, fast and winding tracks with regular concrete culverts to negotiate. We get to our guest house relatively early and there’s time to visit another temple. This time it’s the truly jaw-dropping Koh Ker temple that rises from the flat plain like a man-made mountain. Drinking cold cans of Cambodian beer whilst watching the sun set from the top of this ancient building surrounded by new friends and old mates, it literally feels like we are on top of the world. 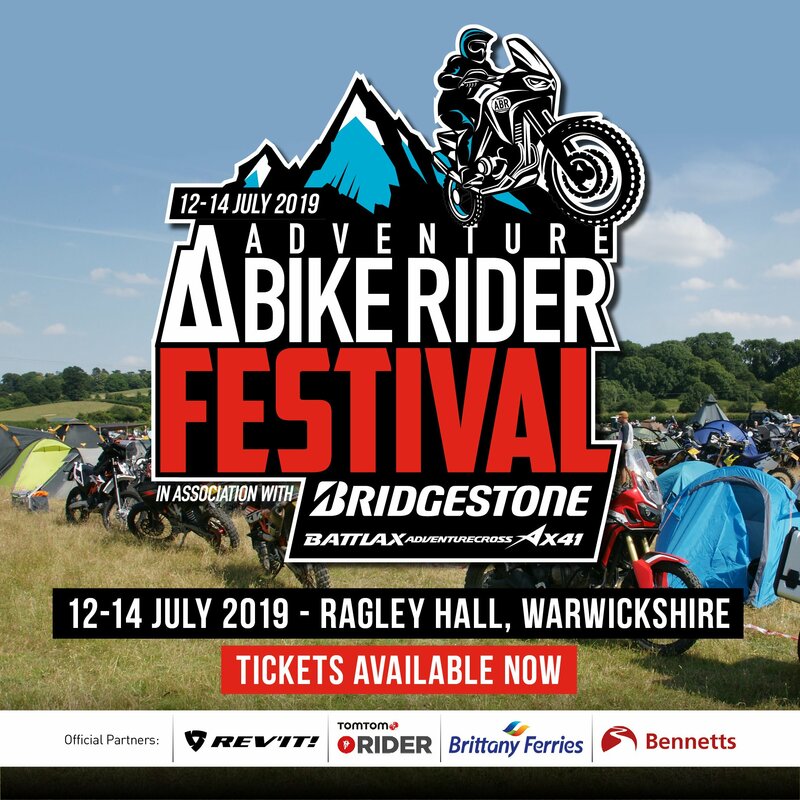 The final day beckons and it’s perhaps appropriate for an epic trip such as this, that we are riding Route 66 into Siem Reap and back to civilisation. The trails are nothing like their American equivalent, but more fantastic with tight sand tracks cutting through dense undergrowth and across creeks. When the trails open up, it’s more sand that demands flat-out, weight back riding that has us all whooping like kids. It’s a great end to the riding and as we pose for a team photo, the grins need widescreen to fit them in. 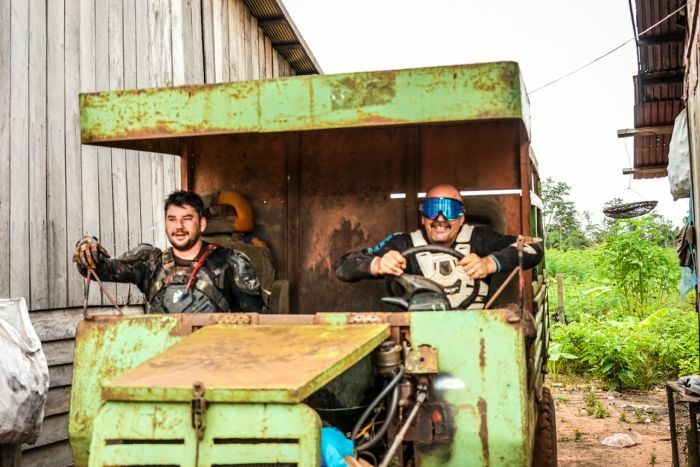 We cruise into Siem Reap like returning warriors, battle scarred but victorious as we slice through the mad traffic that is standard for Asia. When we finally reach the hotel, the sense of achievement is immense and it’s high-fives and man hugs all-round – we’ve done it! The celebrations continue until gone 4AM in Siem Reap’s lively and vibrant Pub Street. We don’t really want it to be over, but our bodies are kind of relieved that it is. So, that’s my Cambodian adventure. A fantastic mix of stunning scenery, unbelievable trails and a great bunch of guys to have ridden with. The organisation has been flawless, the accommodation varied and interesting and the food similarly eclectic. 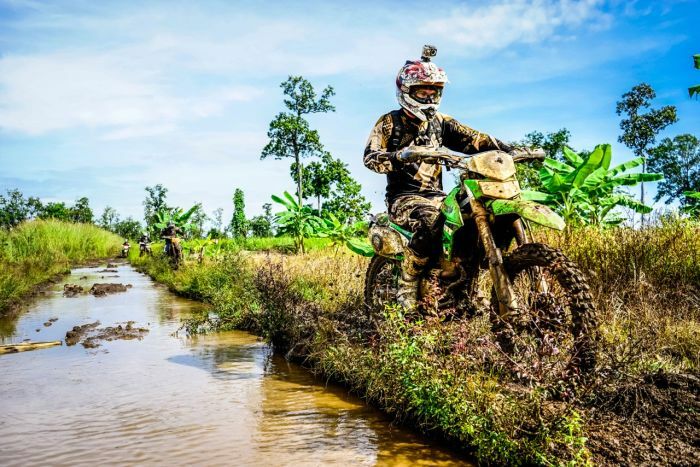 Cambodia is a truly beautiful country and its people have been warm, welcoming and friendly to a group of grubby and noisy dirt bikers invading their country. 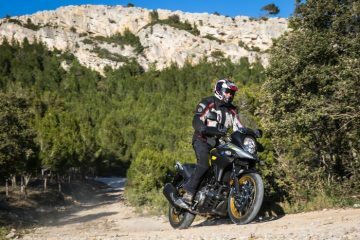 If you want an epic motorcycle journey, this ticks every box and I feel privileged to have been part of it. If you fancy going on this tour, it’s an easy process. 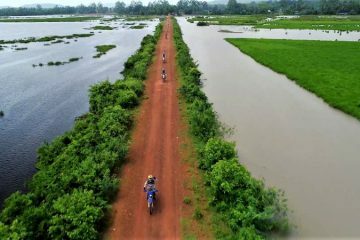 Ride Expeditions sort everything out from the moment you arrive in Cambodia, so all you need to book are your flights to Phnom Penh and outbound from Siem Reap. Other than that, all your transport costs, excursions, breakfast and lunch, refreshments, the whole shebang is included. The only thing they won’t cover is your evening meals and beers, so we just split the bill. You’ll want to shop around on the flights, Skyscanner is a great resource, but don’t try to save a few bucks with multiple transfers – it’s no good if you are in Cambodia and your riding kit is in the Philippines! Return flights from London Heathrow start at approximately £988. You’ll also need a tourist visa, which can be bought at Phnom Penh airport for around $40, and dollars are welcomed everywhere. 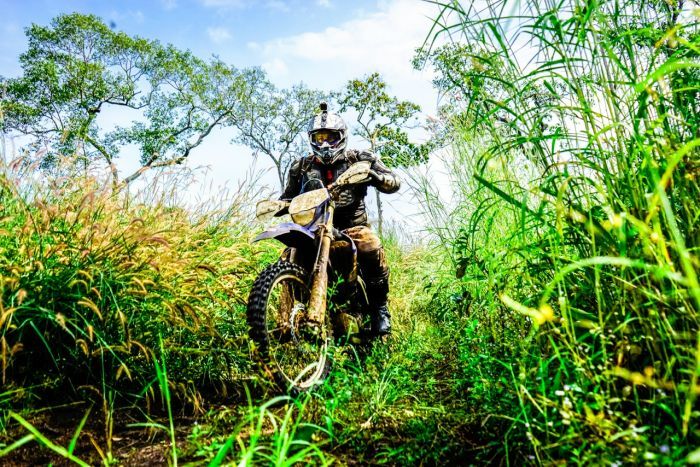 In terms of experience, you need to be a relatively confident off-road rider as the trails can get pretty challenging. 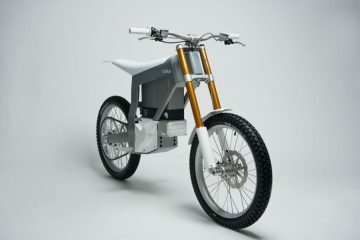 Ideally you’ll want to bring your own riding kit, although you can hire it from Ride Expeditions. Aside from Toby, who rides all the tours and is the travelling medic, there’s a lead rider, rear sweeper, and support truck carrying spare bikes. If it all gets too much, you can travel in the truck!